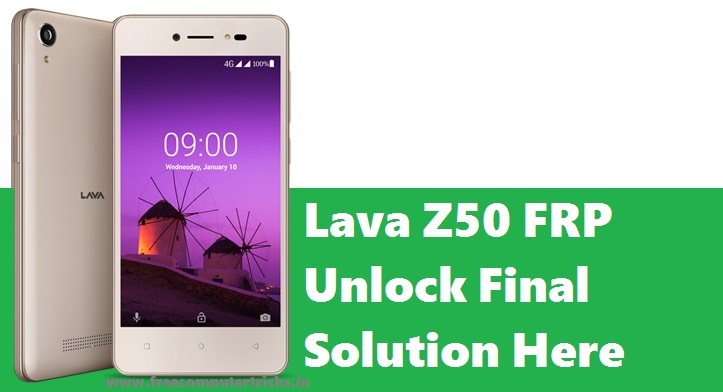 Hi friends, welcome to another interesting tutorial from Free Computer Tricks, today this tutorial belongs to How to unlock frp on Lava Z50? final solution. So here we will give the tested and 100% working solution fro bypass frp on Lava Z50 which has a MediaTek MT6737M chipset. This process includes the frp bypass without using any Mobile flashing box or any other special flash tools. In this article you will know how to bypass frp unlock and solve Tool DL Image flail solution of Lava Z50 using Smart Phone Flash Tool or so called SP Flash Tool. As you know the Lava Z50 released on March 2018 in India and let's know some technical features of this phone. It's a Dual SIM LTE smart phone with Android Oreo operating system runs on MediaTek MT6737M platform, the phone also has a Quad-core 1.1 GHz Cortex A53 CPU and Mali T720MP2 GPU with 8 GB internal storage and 1 GB RAM, you can also expand it upto 64 GB using microSD card slot. If yo look at the camera features it has 5 MP auto-focus main camera and 5 MP front camera. The phone has a Li-Po 2000mAh removable battery and with other basic features such as Wi-Fi, Bluetooth, GPS, Radio, Accelerometer sensor, proximity sensor etc. This is one of the cheapest smartphone in India, available with a price tag INR 4.399/-* approx, you can check the current price of the phone on any online store. After extract you will get Lava Z50 Flash Tool and FRP Bypass Files. Now Open SP Flash Tool (Open SP Flash Tool v5.1708 Folder and Double Click on flash_tool.exe). Now load Android scatter file (MT6737M_Android_scatter.txt) in the Flash File Images folder. Now go to Format Tab on SP Flash Tool and select Manual Format Flash. After format OK remove the phone and switch on the phone and you are done. If you are facing Tool DL Image Fail after flashing or unlocking frp on the Lava Z50 Android smartphone then here is the solution. If the phone is showing Tool DL Image fail then it's continuously restarts and you unable to use the phone, but after following the below steps you can easily recover the phone to normal mode. It's similar to the above FRP unlock step but instead of Format here we do Flash or Download Firmware Using SP flash tool. Download Lava Z50 FRP Solution.rar file from the below link. Open SP Flash Tool and Load MT6737M_Android_scatter file. Now go to Options --> Option --> Download and Select USB Checksum and Storage Checksum. After Download OK remove the phone and switch on it, now it will work fine without Tool DL Image Fail error on your Lava Z50.